Tag Archive | "Intag farmer"
This message looks at how to take advantage of micro sector booms and Ecuador coffee. We begin with an excerpt from a recent multi currency lesson on coffee. When one becomes involved in things that are of interest, discipline comes more naturally. 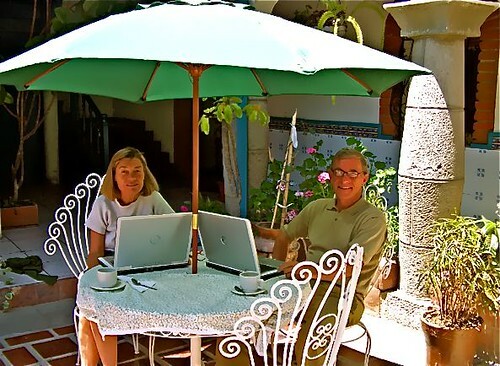 Here I am with Merri at our Cotacachi hotel, working in the courtyard… with our coffee. Sometimes… really simple, in our face things…. can give us investing clues. Warren Buffet for example made fortunes from shaving, ice cream and Coca Cola. The Coffee Micro sector has been caffeine fueled! A recent USA Today article by by Matt Krantz entitled Coffee stocks are piping hot these days shows why simple ideas… that create micro sector booms… combined with value… create opportunity. Looks like coffee is starting to perk up on Wall Street. While the broad market is struggling to hold its recent gains, shares of five of the largest publicly traded coffee companies are on a high boil. Shares of Diedrich Coffee (DDRX) are up 4,525% this year, Green Mountain (GMCR) has doubled and even Starbucks (SBUX) is up 50%. • Do-it-yourself. Green Mountain is at the center of the make-your-own trend, as it makes popular single-serve coffeemakers under the Keurig brand name. Consumers drop a small coffee-filled pod in a machine, and coffee flows into a cup. • Cost control and better store traffic. Starbucks rose 3.3% to $14.16 Tuesday after Robert W. Baird analyst David Tarantino upgraded it to outperform, saying advertising helped boost coffeehouse visits. And a close eye on cutting costs improved profit upside for Starbucks, says Cowen analyst Colin Guheen. • Low share prices. It didn’t take much confidence to make investors willing to take a shot on the stocks, because they were priced for disaster. Diedrich and Caribou Coffee (CBOU), for instance, started this year at less than $1.50 a share. 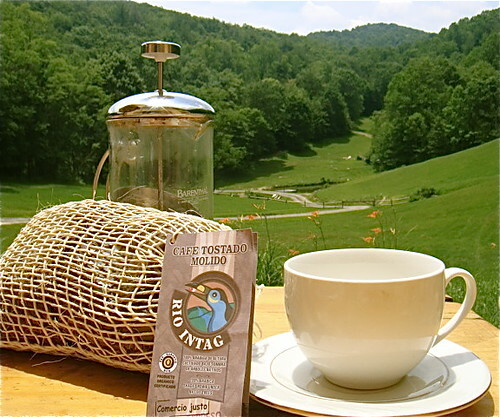 I like coffee so much I bring back Intag organic coffee from Ecuador to enjoy when we are at our farm in North Carolina. More on Intag and Ecuador coffee in a moment. We’ll see in a moment why Peet’s shares may be poor value, but the point is not that we should invest in coffee shares… or coffee at all. The shares mentioned above may or may not offer good value. The lesson here is that we can look around our home, our office or place of work. We can assimilate what we see in our travels… what we do each day… what we are involved in. This observation can give us obvious clues. We do not have to invest in rocket science to make money either. Often the big money is in the mundane. We need to spot ideas about things that we know… that make sense from our perspective… before they become a hot trend in the market place. Then, if we get lucky, the trend will catch on. If we are not lucky… but have invested in value… the shares will rise anyway… but in a longer term. The coffee mania coffee shares may be caffeine charged, but too much caffeine makes the hands jittery and… perhaps… makes share prices shaky as well. Let’s use this micro sector boomlet to see what to do to take advantage of micro sector booms. Keep in mind the way these micro sector spurts work. First, one coffee share takes off. Maybe the share is a good one. Maybe not. Then, the second and maybe a third share takes off. Then even bad value coffee company shares begin to rise. Peet’s (the coffee & tea company) can give us an idea of how one can think these micro sector booms through. The first valuations of a share’s value always relate to management skill and experience, market share, PE ratios… price to cash flow… return on dividend and yield, business plan and future of the market, etc. Then look at the history of the share price. Peet’s shares, despite the caffeine boom are in a longer term on a down trend… even though it was bucked up by the coffee boom. Here is a two year chart of Peet’s price. Then look at volatility. Here we see a bit of a roller coaster. Next look at the currency in which the share is denominated. Peet’s of course is a US dollar denominated share. 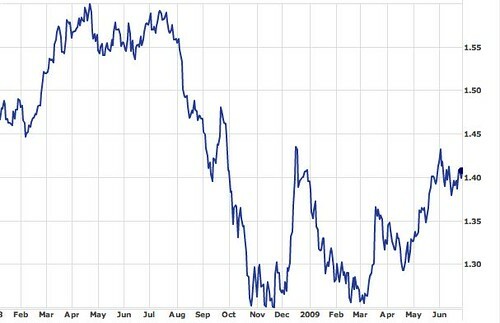 A look at an 18 month dollar euro chart shows that if you jumped in March 2009 exactly when the Peet’s price was starting its most recent climb you lost a third of the profit, in euro terms, due to the US dollar’s fall. The Peet’s share price went from $20 to $27, a 35% jump. However the greenback tumbled from $1.25 per euro to $1.40 per euro, about a 12% loss, in the same period. US dollar versus euro January 2008 – June 2009. Next look at the currency stability factor of the share. All the coffee companies have a fairly high currency stability risk because the expense of their main commodity is a big part of their cost in relationship to overall income. The cost of silicon is low in relationship to the cost of a computer, etc. The cost of coffee in relation to the price of a cup of coffee is high. Coffee companies sell a refined commodity… i.e. coffee. In times of inflation, their main ingredient cost is likely to rise enough to have a direct bearing on the sales price of the product. Next look at sales. If a company is doing business around the world, it has greater commodity stability. The income is in dollars, yen, sterling, euro etc. Starbucks for example has about 12,000 stores, almost 4,000 of which are in 36 countries outside the U.S. US consumers drink only about 20% of the world’s coffee. Starbucks aggressively sells its offerings in countries that already have dedicated coffee or tea drinkers and international revenues have been jumping over 30% a year. Nearly 30% of total company revenues now originate outside America, up sharply from only 9% in 1997. Peet’s Coffee & Tea Inc. (PEET) on the other hand expands mainly in the US by using targeted advertising, such as direct mail and email. Peet’s has multiple channels to sell its products, including retail stores; home delivery; food services; office; and grocery stores. Peet’s coffee is currently sold in over 3,500 grocery stores… leaving it much more vulnerable to a drop in the buck. Peet’s has some good points. Sales rose by 14% in 2008. Corporate executives agreed to a management salary freeze for 2009, while increasing salaries for hourly workers. Starbucks’ heavily reliance on expanding stores to increase sales, requires more capital and risk than Peet’s approach to grow at a more measured pace and focus more on grocery store alliances to sell coffee beans. Peet’s strategy paid off in the down turn, but is this the most dynamic approach wen the recovery comes. Peet’s share price has risen 35% on sales growth of 14% and lower profits. This does not make sense from a value point of view. There are many factors to judge when trying to find value either in a likely trend (that has not happened) or in a micro sector boom like coffee. The two factors that make consistent success in this investing process more likely are sticking to what you know and always looking… hard… for signs of good value. This research led me to find a company that earns a sixth of its income from coffee… has paid a dividend every quarter for the past 60 years, has earnings from over 50 countries, yet its shares are down 30%. I have just sent our multi currency email course subscribers a report on these coffee related shares now have a strong technical analysis showing that their price is in an upward trend now. Learn how to subscribe to our emailed multi currency course and receive this coffee share report here. 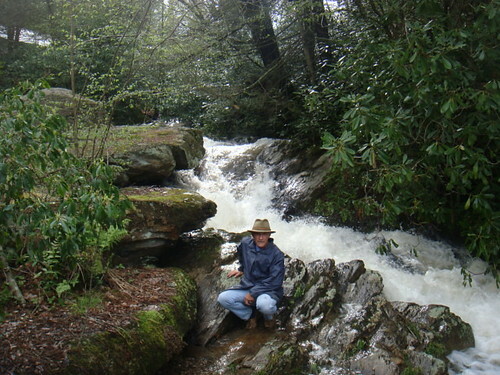 Join us July 24-26 in the Blue Ridge and save $249. You can have the $175 multi currency subscription free when you enroll in our upcoming July 24-26 International Business and Investing Seminar. You save $175. More details are below. Few know that just 15 miles from Meson de las Flores in Cotacachi lies the tropical Intag Valley. This is where I get our Ecuador coffee. Though close in miles, Intag is a two and a half hour ride by car. Apuela is the first town of any size in the Intag. As you enter the Intag valley the village presents a remarkable view stretching into the distance. Far below, on a spur of land above the valley floor Apuela is hemmed in by green cliffs on both sides. Here is this view of Apuela. The valley floor has been carved by the waters of River Intag rushing headlong towards the Pacific. This valley appears to be no more than a quarter of a mile wide and much less in places. Here is the Intag River . Apuela itself is a mix of concrete and rustic buildings situated in a low canyon on the main road into town. Local produce spills from little stores. Now and again a sign offers accommodations or lunch. 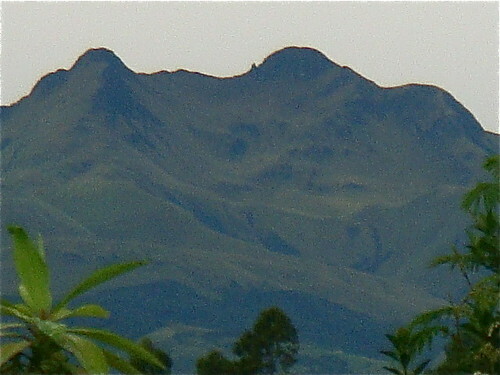 Apuela is the home of the Intag Coffee Company. We serve only the delicious, organic coffee from Intag at our hotel Meson de las Flores. One of our readers who stayed at Meson tested Intag coffee for acidity and it scored a remarkable 6.7 on the ph scale! Unbelievable! Most coffee is truly acidic. Intag Coffee Company is a cooperative located in a small cement and wood construction just off the main square. You can smell the coffee roasting as you enter the main door. Here is one of our trusted taxi drivers, Isaak, looking at the huge bags of raw beans brought to the roasting house by the farmers of this cooperative. Though a small operation, Intag coffee sales are steadily growing and demand often exceeds supply. The cooperative’s aim is fair trade and they pay far higher prices to local farmers than the Ecuador norm. The coop grades the beans in the roasting and packing center. Then begins the roasting procedure. In Intag one can buy wholesale or retail, with packaging or without. Raw, white beans are available to roast or roasted whole or ground coffee is sold. There is a selection of three roasts; expresso, medium or fine. Here is the roaster machine and the beans. Intag Coffee has a very efficient operation that exports to Spain and Japan though not yet to the USA or Canada. Here´s a picture of their Japanese Intag, fair trade, organic coffee packaged and ready to go. The raw organic coffee for the coop comes from small farms settled around Apuela and scattered throughout the Intag. Here is an Intag farmer picking coffee. Sadly, many of the restaurants and cafes throughout Ecuador serve Nescafe instant coffee. Not us at Meson de las Flores. 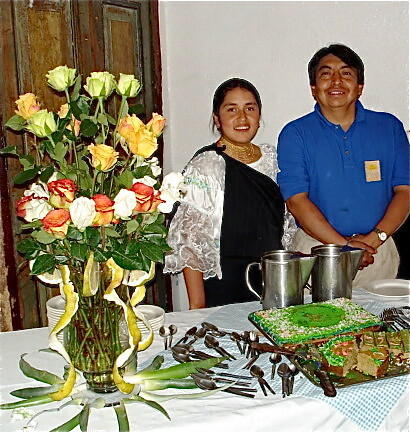 Here is Consuelo and Eduardo serving coffee and a high protein welcome quinoa cake to delegates at a recent tour…. always Intag organic coffee. We brought back Intag coffee to serve to our delegates at our July 24-26 North Carolina course, so whether you are thinking Ecuador coffee to drink or about coffee shares to own, you can know more about it from our North Carolina course. 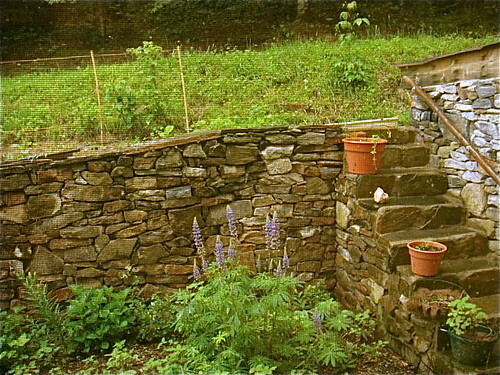 Join us July 24-26 in the Blue Ridge and save $175. the mountain flowers peeking into our kitchen. 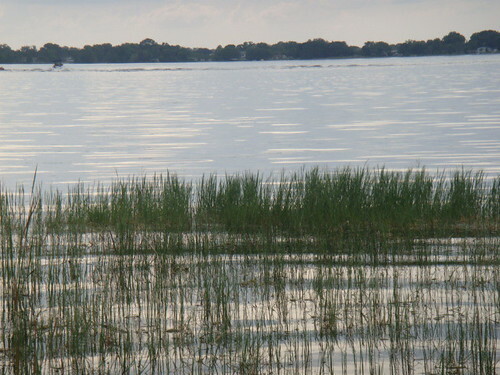 We love our life in Florida… here is a view from one of the houses on our recent house buying trip there. Plus we’ll look at investing and living in the Andes. 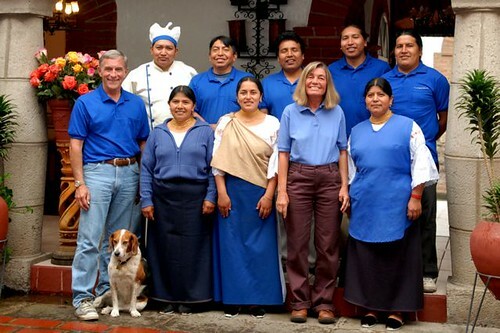 Here we are with our Andean family at our hotel Meson de las Flores. 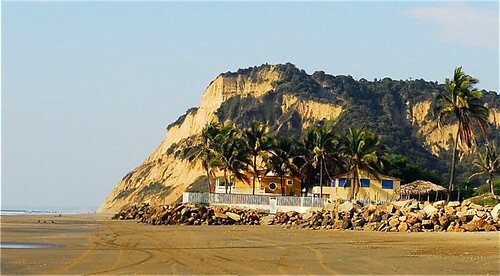 We also look at Ecuador beach investing. We review tax and asset protection benefits from global business and investing as well. Plus we’ll look at coffee shares.